The QV-1000C is an analog black and white still video camera with a 380.000 pixel CCD sensor. Images are stored on a magnetic two inch video floppy disk. Technically, it's not a digital camera. I started collecting information about this particular camera in 2005, and have been planning to write this article ever since. It's taken this long mostly because I've never felt I had enough unique material to do this rare historical camera justice. The technical stuff is easy: I have the original instruction manual, press releases and brochures. I even have the camera. But I wanted this to be a historical article, not a technical one. Luckily, I've been fortunate to get in touch with some key people with unique insight into the development, marketing and real world operation of the QV-1000C. 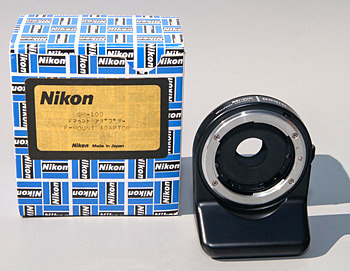 The official Nikon QV-1000C product photo, being distributed with the original press release in August 1988. Nikon photo. 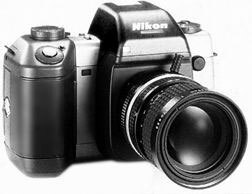 Nikon's own QV-1000C test photo, distributed as a print with the original press release in August 1988. When I started NikonWeb.com in 2005, there was almost no substantial information about the QV-1000C on the Internet. Or in printed literature, for that matter. For a long time, the only reliable source of historical information was an article on Nikon's own web site, in their Nikon family cousins series. If you're interested in the early history of electronic photography, this is a must-read article written by Mr. Kenji Toyoda, the Planning Manager of Nikon's Electronic Imaging Division from 1988 to 1990. In June 2005, with the assistance of the former Norwegian Nikon distributor, Interfoto, I was able to track down the only QV-1000C kit in Norway. A year later, I was extremely lucky to come across a second QV-1000C, originally used by the Associated Press in the USA. I got this camera from former AP photographer Bob Daugherty, who provided valuable information about the history of this particular body. After posting a question on the Nikon Historical Society discussion forum in June 2005, I was approached by Uli Koch, a well known German Nikon collector and author of the Nikon F triology. Uli happened to have a QV-1000C in his collection, and was kind enough to share all the information he had, including an English language press release and a rare letter from Nikon Europe, sent to local distributors a few days before the camera was officially announced. Uli also forwarded my first questions to Kenji Toyoda, which he had met at the Nikon Historical Society convention in Tokyo in 2004. Since then, Mr. Toyoda has patiently answered all my questions and been of invaluable assistance. Then, in January 2011, I came in contact with Alan Bartlett, who founded Nikon's European digital imaging division in 1988, the same year as the QV-1000C saw the light of day. Both Alan and his North American counterpart, former Nikon manager John Harcourt, have provided much of the information below. I could not have written this article without the generous assistance of these gentlemen. Some of the information and stories in this article have been previously published on NikonWeb.com, but you'll also find plenty of exciting new information being shared publicly for the very first time. This is mostly about Nikon's first electronic camera, but hopefully you'll also learn a thing or two about other technological achivements over the last century. One of the earliest drum transmitters. The basic technology didn't change much in half a century. Popular Mechanics, September 1937. Perhaps a little premature, but electronic photography was beginning to attract a lot of attention in 1988. News photographer magazine, June 1988, a few months before Nikon announced the QV-1000C. Nikon's direct film transmitter NT-1000A (1983). Photo by Jarle Aasland. Not too many years ago, transmitting news photos from remote locations was a relatively complex task, requiring both special skills and a strong back. Not only did the photographer need to carry cameras and lenses, he (or she) also needed to bring a complete darkroom for developing film and making black and white prints, which would then be transmitted back home using an analog wirephoto transmitter (sometimes referred to as a telephoto transmitter). The transmitter was connected to a regular telephone line, often requiring the photographer to hack the telephone or the phone socket in a hotel room or some other location. 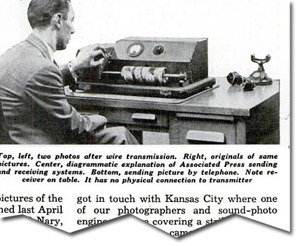 The wirephoto technology has been around since the early 1920s, when the first electronically transmitted photograph was sent by Western Union. The Associated Press started its wirephoto service in 1935,  but half a century later, photographers were still required to go through the time consuming process of developing film and making wet prints that could be transferred using analog drum transmitters. 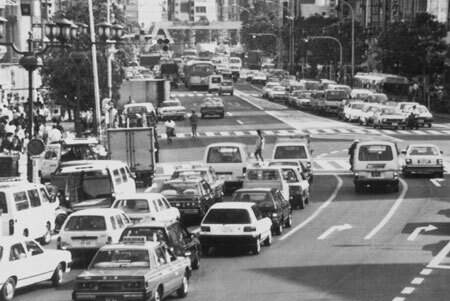 Then, around 1981, a brilliant idea came up when Kenji Toyoda and a few staff members of Nikon's camera development department met with the photo department of Kyodo News in Japan. So, while waiting for technology to improve, wouldn't it be possible to read and transmit the image directly from the film, instead of first having to make a print? This would save valuable time. Kenji Toyoda came up with a proposal which he presented for the head of Nikon's Camera Division Planning Department. The decision to push ahead was quickly made, and led to the development of the Nikon NT-1000 Direct Transmitter, which was released in 1983. The transmitter, Nikon's first, brought about a revolution in the Japanese press. 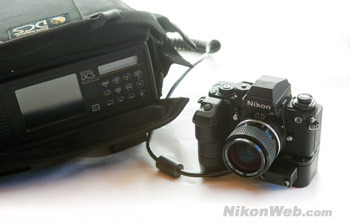 Nikon's third and last wirephoto transmitter, the NT-3000, was released in 1993. Doing research for this article, I came across a claim that Leaf Systems introduced the first portable negative scanner and transmitter in 1988. This is not correct. Nikon's NT-1000 was first. The highly specialized wirephoto transmitters were used by press photographers until the mid-1990s, when portable computers and film scanners made the old hardware obsolete. Also, in the mean time, electronic and digital cameras had become good enough for newsprint, and the world of photojournalism would never be the same. 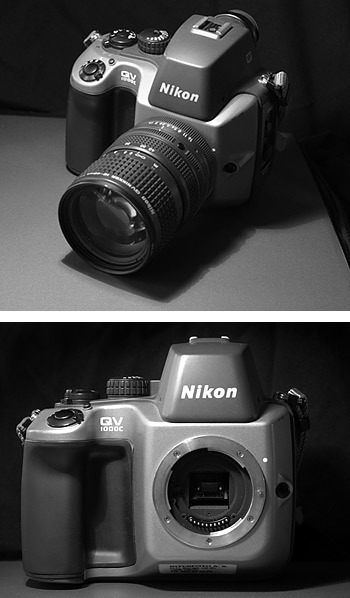 The QV-1000C was developed by Nikon's Electronic Imaging Development Division. Mikio Takemae was the leader of the development team. Tadashi Ohta and Koichi Higashi were also members of the team, to name a few. Kenji Toyoda was the planning manager in charge of the QV-1000C. Asking how many people worked in Nikon's Electronic Imaging Division at the time: "it's a company secret". "Partly 'yes' and partly 'no'. As you know, the video movie camera and the still video camera are different in many aspects. So, there are some technologies in the QV-1000C which were inherited from the S-100. On the other hand, there are a lot of technologies which had to be newly developed for the QV-1000C. The S-100 might be a great uncle of the QV-1000C rather than a direct predecessor." Nikon SVC prototype by Panasonic. PTN Daily News, Photokina 1986 (click to read). 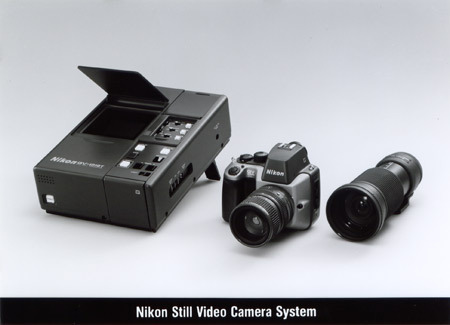 Nikon's Still Video Camera (SVC) prototype was first showcased at Photokina 1986 in Cologne, Germany. But despite the fact that Nikon was already working on their own technology, this first prototype was made by Matsushita Electric (Panasonic). Nikon did not have sufficient technologies for video signal processing at the time. In other words, the Nikon SVC is not really the predecessor of the QV-1000C, which was developed by Nikon themselves. According to Kenji Toyoda, “these two still video systems are totally different”. The Panasonic-built Nikon SVC featured a 300.000 pixel sensor, but light sensitivity was limited to 100 ISO (or ASA, as it was called at the time), which made the camera too slow for real world photojournalism. It is not known how many SVC prototypes were built. 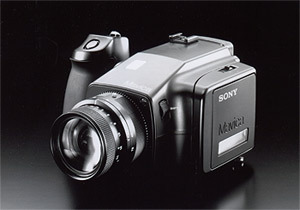 Following Photokina, the camera was shown to journalists visiting Nikon Europe in December 1986. It was also on display at the Photo Marketing Association (PMA) trade show in Chicago in 1987. 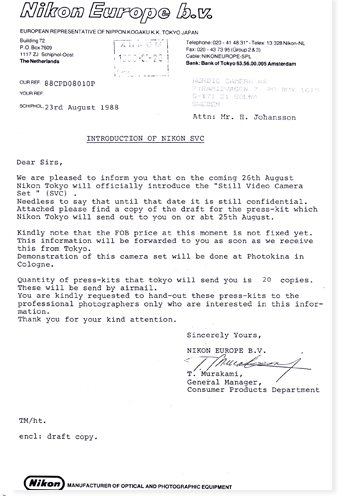 Three days prior to the official QV-1000C announcement, Nikon Europe sent a letter to Nordic Camera AB, the Swedish Nikon distributor at the time (and presumably to other European distributors), where they informed that Nikon would officially introduce the "Still Video Camera Set" (SVC) on August 26, 1988. The QV-1000C designation was not used. According to the letter: "Quantity of press kits that tokyo will send you is 20 copies. These will be send by airmail. You are kindly requested to hand-out these press-kits to the professional photographers only who are interested in this information". The letter is signed by T. Murakami, General Manager, Consumer Products Department. "At that time, the management of Nikon was very reluctant to sell this camera. 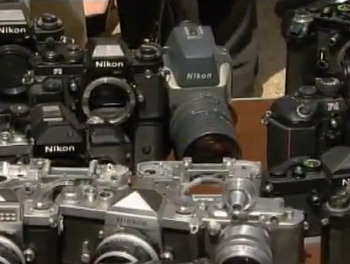 Though Nikon developed this model to respond to strong requirement from newspapers, production of this system caused significant amount of financial loss. So, as a planning manager in charge of the QV-1000C system, I was told to make as few units as we could to suppress the loss. Each time we sold a QV-1000C, the loss of Nikon Electronic Imaging Department increased significantly." "It's not so simple. If we had increased the price to get sufficient profit, it must have been so expensive that no one would purchase the camera. The price must be reasonable for the customers. But the loss must be suppressed to the acceptable level. So, it was decided as a compromise." So how much did it cost Nikon to produce the camera? "I don't remember the cost. Even if I do, it must still be a company secret." 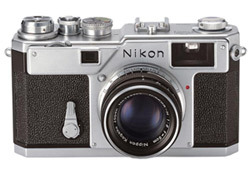 Nikon S3M half frame rangefinder camera. Almost as rare as the QV-1000C. Approximately 180 QV-1000C kits were made. Probably less than half of them were shipped out of Japan, according to Mr. Toyoda. John Harcourt estimates that there were probably fewer than 30 QV-1000C kits in the US, but says it would be difficult to confirm. Up until now, the Nikon S3M half-frame rangefinder camera from 1960 has been considered Nikon's rarest regular production camera. Total production was 195 units. Time to rewrite the books, (unless, of course, you want to argue that the QV-1000C isn't a "regular production" camera. In many ways, the QV-1000C could be considered an experimental prototype). According to Kenji Toyoda, the QV-1000C sold well in Japan (relatively speaking, of course), but apparently several of the electronic camera kits shipped to Europe and North America were loaned away to various newspapers and news agencies for evaluation and, over time, simply disappeared. More about this later. If you're wondering about the name, QV is an acronym for "Quick Vision". The number, 1000, has no special meaning, and the "C" is for camera. No big surprise then that the "T" in the QV-1010T means - you guessed it - "transmitter". All this according to Mr. Toyoda. It was in 1988. Just before my visit to Photokina, I talked with a chief editor of a Japanese photographic magazine, a friend of mine, and made a secret plan that I would take pictures of Photokina exhibition with the QV-1000C and immediately transmit them to Japan to put them on his magazine with my brief report. But when I arrived at Cologne, I was told we are prohibited from transmitting any pictures with QV-1010T because we had not got the certification of German regulation for communication equipments. It was so valuable a chance to show the advanteges of an electronic camera, that we could hardly give it up. So, I told the engineers who accompanied me "OK, let's go on as planned. I will take all the responsibility". After looking around the exhibition and taking pictures with QV-1000C, two engineers came to my hotel room and began the secret work. The room telephone set was almost throughly disassembled to connect the line from the transmitter. They called Nikon factory in Ohi, Tokyo and tried to send the pictures while talking with the engineers there. But it could not easily done because of the telephone line condition between Germany and Japan and took almost whole night until we finally succeded. Afterwards, I was surprised when I checked out the hotel and looked at the bill. They charged about two thosand dollars for the telephone call! Fortunately, I was not arrested by German Police for illegal use of telephone line. The following part is written by John Harcourt, the manager for strategic marketing at Nikon Inc. in North America from 1988 to 1996. 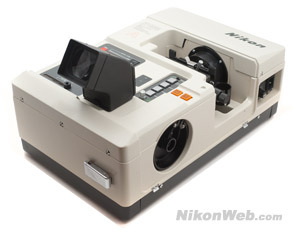 I was hired by Nikon Inc. in 1988, specifically to launch Nikon Electronic Imaging, as we called it back then. And as the founding member of the group, I was entirely alone for months before we began hiring. But I digress, so to get right to the matter, we had a few QV-1000's to loan, as Tokyo was eager to repeat their success in Japan by getting it to European and North American agencies. And yes, one did indeed make its way to the AP, although I am not sure I would classify this as a "sale". AP was anxious to test it and we had a willing tester, and that's the simple way things worked at Nikon and other camera makers at the time. We consigned prototypes and production equipment to our most enthusiastic customers, and that equipment rarely made its way back to our consignment locker, which could be a problem because all these consignments would go out under the requestor's names, and we were individually responsible for getting equipment returned. The company would send us statements every month detailing, in many cases, hundreds of thousands of dollars worth of inventory that they would eventually write off after they had come to terms with the fact that the equipment was simply not coming home. 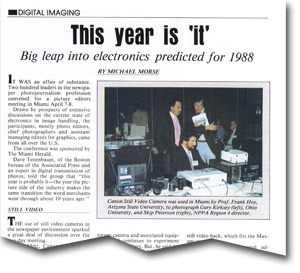 AP photographer Ron Edmond's inauguration photo was probably the first QV-1000C picture printed in a US newspaper. Rochester Times-Union, January 20, 1989. For this reason, it is possible you might find QV-1000 cameras and lenses, or perhaps even an intact kit as there were several that "disappeared" (check yard sales...we found an LS-3500 scanner, new, in a dumpster in Washington DC in 1992). By the time I left in the late 90's there was only one kit left, and I'm not sure what became of it. Anyway, as you probably know this kit came with a short and a long zoom designed specifically for the 2/3" sensor, packed up in a nice padded case, and of course with the transmitter and some floppies. I can relate my own experiences with the QV-1000, and can point out some conspicuous pictures taken with it (such as the widely published inauguration photo of George H.W. Bush in 1989). Long story short, though it was a uniquely elegant and very forward-thinking, even prescient design, we had a hard time getting acceptance, mostly due to usability issues. The QV-1000 was the culmination of everything we knew about building a handheld image processing device that was weather-proof, rugged enough to be abused, and could run for a sufficiently long period on a charge. Image processing workstations were still behemoths in those days, color was not yet viable, and digital imaging was not an option due to the costly memory and processing cycles required (memory was $200/mb). So the QV-1000 was the culmination of analog imaging, with the addition of storage, the product of Sony's work with CCDs and 2" floppy recording media, and CCD video was a new industry in which they were trendsetting at the time, having won the battle with Ikegami and the videcon that very year. The QV-1000 was an effective substitute for BW reportage photography on film, especially when the alternative, processing film in the back seat of a jeep in the Iraqi desert for example, was just not an appealing solution. But this was a real and familiar camera (to photojournalists), compared to the other "still video" devices available from Sony and Canon, which were decidedly not designed by camera designers and had far too many flaws to make them more useful than a doorstop, which is what they became. (More about this later). QV-1000C mirror self portrait, as seen on the QV-1010T transmitter monitor. The QV-1000 was the obvious progenitor of the modern pro-sumer DSLR. But, as visionary as it was, it suffered from a tiring viewfinder with a too-small and too-dark viewing screen, and the lenses were very slow, making focusing difficult, and this was long before LCDs and LEDs were integrated into brighter viewing systems with larger sensors, and before they had begun to realize how difficult it was for photographers to adapt to a challenging viewing system. Nikon had decided they needed a few more years to develop the right kind of focusing solution, and they saw a digital alternative to the then-viable analog "still video" system. So they decided to produce a limited run and test the water...find out what they needed to know without going into production. Still video technology was dead long before the camera came to market, but that was no reason not to test with willing photographers. And I spent several years shooting at prestigious events such as the Super Bowl, the Academy Awards, etc., etc., using still video, film transmitters and scanners and digital cameras to prove the usefulness of near real-time image distribution that has become a commodity and a staple today. However, the QV-1000 is very rare, and a true collector's item, and I'm sorry to say I do not have one. The next part is written by Alan Bartlett, the Divisional general manager at Nikon Corp. from 1984 to 1994. I started working with Nikon in 1984. My job was to market the new products that Nikon was just starting to roll out as a prelude to a new generation of digital cameras and business imaging products. I built up the business in the UK and in 1988 was given the responsibility for marketing the products across all of Europe, Middle east and Africa. Regarding the QV-1000, a monochrome Still Video Camera which was only sold as a package with the QV-1010T Transmitter, no units were ever actually sold in the UK, although it was evaluated by several UK newspapers. It was first used in the UK to cover the Lockerbie disaster in 1988, although the images taken were never used in print. It can however rightly claim to be the first electronic still camera ever to record an image which was printed in a UK newspaper (the Evening Standard). The picture (of Margaret Thatcher opening the Harmsworth Printing plant in Docklands in 1989) was taken in Docklands, transmitted via a mobile phone (expensively!!) to the Standard's offices in Kensington where it was used in the live production system and then sent back to Harmsworth's plant assembled into a page for printing into the newspaper, a copy of which was handed to Margaret Thatcher as she came to the end of the tour. As it was based on the analogue NTSC video format, the image resolution was only acceptable for reproduction in newsprint at small sizes. Canon and Kodak both launched similar products around that time which also suffered from similar issues. One prototype QV-1000 camera that was used by us in Europe for demonstration, was stolen at an exhibition in Milan, Italy and was never recovered. We always laughed about the thief going to a camera store and asking for film for it!! I remember being invited to give a presentation about the future of photography to a group of Norwegian (and some Swedish) photographers sometime in 1988. I brought along a QV-1000C Still Video camera which I think was the first time such a camera had ever been shown in the Nordic countries. I recall I was very busy at the time with no time to prepare a big presentation. In order to get me to fly over, Rolf [Rolf Petterson of Interfoto, the Norwegian Nikon distributor at the time] told me that it was a very informal gathering to just to a select few. Unfortunately, he forgot to mention that he'd invited about 400 people and it was taking place in a large theatre. I had no slides prepared so just talked and invited the audience to come close and play with the camera. I think it worked just because it was such an important product which everyone wanted to see, so nobody cared too much about what I was saying. BTW, I saw a QV-1000C SVC on Nikon's stand at Focus on Photography two years ago in the UK in their "history of Nikon" display. It was labelled as an "early digital camera". I had to remind one of the guys that it wasn't a digital camera! Electronic yes, but digital no. Another story about the QV-1000C you might be interested in was the time we took the camera to a photographic exhibition in Prague in 1988, I think. I know the Berlin Wall was still very much in place, and Czechoslovakia, as it was then, was a very unwelcoming, austere and authoritarian place. As I liked to live dangerously, I thought it would be fun to drive there so alone I set off across Europe, through West Germany, then East Germany to Czechoslovakia. All went well, I had the correct papers and had few problems until I reached a small Czechoslovakian border post at about 02:00 in the early morning. In my best German, our only common language, which actually wasn't a good choice (for historic reasons!! ), I tried to explain what the QV-1000C was. They saw it was described on the paperwork as a camera and demanded to see the film it used!! Electronic still photography was a very hard concept for them to grasp so in the end to avoid arrest, I had to unpack the system and demonstrate it to them. It was and still remains the most bizarre product demonstration I have ever given. At 02:30 in the morning at a lonely Warsaw Pact border crossing, I was taking pictures of a group of 5 heavy-duty Czech border guards all proudly holding their AK-47s, lined up outside their post and showing them the pictures on the tiny player screen. In the end, I had to give them a mini-floppy disk each as a 'sweetener' so they would allow me through. I still sometimes think about those border guards with their floppy disks and nothing to see their pictures on. Alan Bartlett is now running a marketing consultancy agency based in Oxford, England. You'll find his website at www.alanbartlett.com. In 2006, I came in contact with former AP photographer Bob Daugherty, a veteran photojournalist who has covered major news stories for several decades (among them, president Richard Nixon's historical visit to China in February 1972). 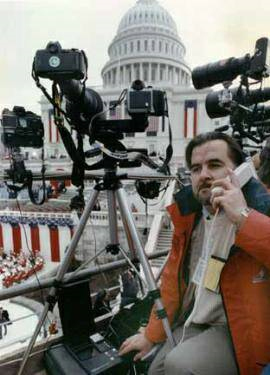 Ron Edmonds with the QV-1000C and QV-1010T transmitter unit at the 1989 presidential inauguration. Photo used with permission. Bob kindly offered me an almost complete QV-1000C kit formerly used by the Associated Press. The only piece missing was the QV-1010T transmitter unit, which was most likely lost over the years (luckily, I already had a transmitter). This particular camera was first used by AP photographer Ron Edmonds to cover President George H.W. 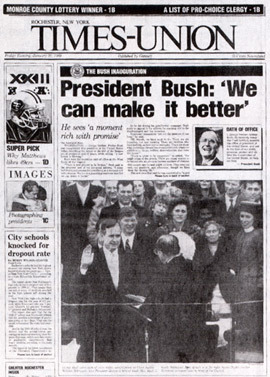 Bush's inauguration on January 20, 1989. The camera's serial number is 200129. "I think it broke a barrier nobody thought would happen - not this quickly. This is like the start of a whole new era in photojournalism. Now we feel confident it will be used for selected events," he said. "The experiment saved about 30 minutes - mainly handling and processing film - and helped afternoon newspapers in the Midwest and West to make deadlines. It dramatically demonstrated the advantage - speed - of electronic photography over silver-based photography, the 150 year old process requiring chemical processing. 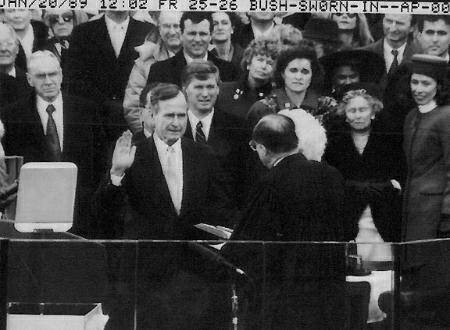 George Bush is sworn in as the 41st US president. 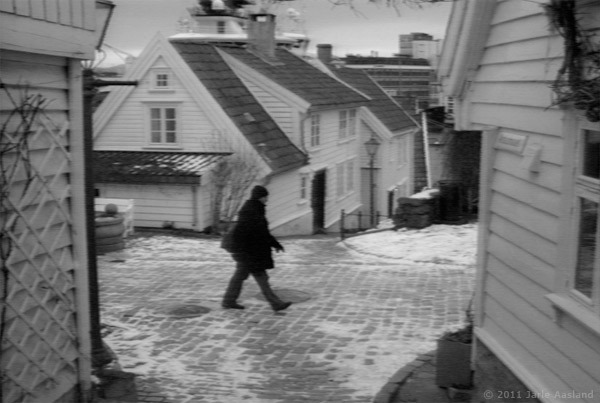 Photo captured with a Nikon QV-1000C still video camera and transmitted to AP's network only seconds after it was taken. Photo by Ron Edmonds/Associated Press. Shortly after the Presidential inauguration, Bob Daugherty used the camera for the president's State of the Union speech before Congress. Later that year, he used the same QV-1000C to cover a Space Shuttle launch. "The camera functioned fine mechanically, but like the early digital cameras - such as the NC2000 - it had a problem handling extreme contrast. Sunlight gave it problems. An overcast day or flat lighting worked well." "Focusing wasn't great to see through the finder. The camera was used only on about 3 or 4 occasions when deadline mattered. Remember, we were still wed to film in those days. The QV allowed us to get off a bulletin image needing only a phone - no transporting film to a lab and processing film. Once the 1 or 2 bulletin pix were transmitted, film images would follow. The quality was in black & white and wasn't too bad if the photo wasn't enlarged greatly," says Daugherty. Unfortunately, the original AP images captured with the QV-1000C are probably lost. "I seriously doubt that there's an image of the launch made with the QV in archive. Remember, there was very little electronic archiving in those days and few images (especially b&w) made it to the archives after electronic archiving came along." The Associated Press only had one QV-1000C camera: "AP really went digital when they developed the NC2000 with Kodak and marketed it. We had a few Canon DCS cameras, but mostly NC2000s. There are three persons that I credit for bringing 'digital' to the newsrooms. Hal Buell, who was formerly the AP's photo editor, David Tennenbaum, who worked on the Leaf project for the AP, and Bob Caspe, president of Leaf. They were all three visionaries and bright minds who were able to think outside the box. The AP was the prime mover in bringing newspapers (and other mediums) into the digital age." "Leafax, the digital scanning of negs and the elimination of a wet print room... the development of the electronic darkroom installed in 1979.... the development of the Leaf desk which allowed reception and handing in the newspaper of digital pictures... the wiring of 1,300 newspaper plants to handle digital from new locations... press room applications... training newspapers in the digital process and encouraging the implementation of digital photography in their operations... finally the development of a digital archive system that permitted the capture and retention of digital pictures in huge numbers, and allowed remote access to picture users. Each of these steps was labor intensive and required considerable talking, educating and refining of the many separate technologies involved. All this preceded the camera and its role to picture journalism." And finally: "There was a large team that made all this come together, including AP President Lou Boccardi who said yes to the multi-million dollar budget that was required," says Buell. Nikon QV-1000C with QV Nikkor 10-40mm. Still video frame captured using Nikon QV-1010T and a USB video capture device. 600 pixel version downsized from 720 pixel capture using Adobe Photoshop. No post-processing, except for overlay text and save as jpeg. The QV-1000C is a fun camera to play with, but there's no longer any reason to shoot one for real. In addition to the lousy image quality, you're constantly worried about breaking something. It's a robust professional camera, but you'll no longer find any spare parts, let alone a trained repairman. (The QV-1000C use the same eyepiece correction lenses as the N-8008/F-801, but that's probably the only piece you can expect to find today). The still frames of analog composite video are stored on an obsolete two inch magnetic video floppy disk. To read these disks, you'll need a vintage video floppy player. I've been using Nikon's own QV-1010T Still Video Transmitter that was part of the original QV kit, but other video floppy players (relatively easy to find on eBay) should work just fine. Unlike a modern memory card, you can't simply copy the image files to your computer (in fact, there are no files. This is an analog device, remember?). Since there's no practical way to receive the images sent from the transmitter (like you would normally do some twenty years ago), you'll instead need to grab the video signal using a video capture card on your pc. This is achieved by connecting a regular composite video cable to the transmitter's video out port. The author's two QV-1000C cameras. Perhaps the only pair found anywhere in the World. The QV-1000C is as responsive as any modern camera. There's no noticeable shutter lag and the camera is way faster than most current models. In fact, the QV-1000C can capture up to an impressive 20 frames per second (with a fixed shutter speed of 1/1000 sec. and the mirror locked up, but still)! All controls are where you expect to find them. Any old Nikon shooter will feel right at home. 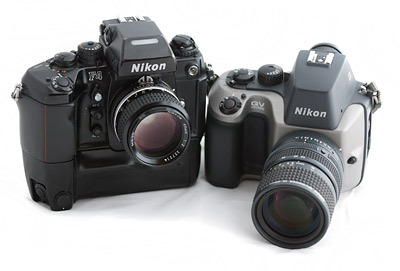 The QV-1000C (right) next to the contemporary Nikon F4, Nikon's first professional autofocus camera. Here pictured with a manual focus 85mm lens. "At the time, autofocus technology was not good enough to satisfy news photographers. Significant investment was necessary to develop new AF sensor modules dedicated to the 2/3 inch format. The AF module for Nikon F4 could not be incorporated in QV-1000C because of significant difference of image size between 35mm picture format and 2/3 inch format." The QV-1000C viewfinder is relatively dark, even with a bright f/1.4 lens. This is probably the main problem from a user perspective. The camera has a plain matte forcusing screen, making critical focusing difficult. 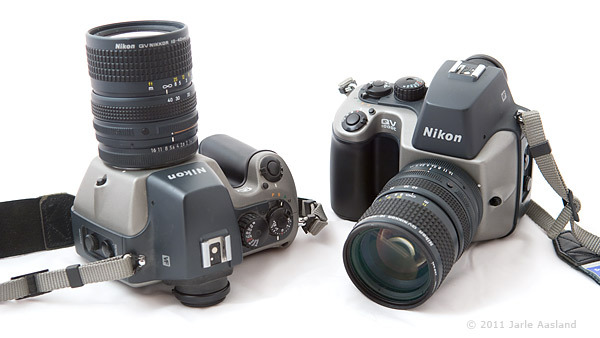 At the time, all other manual focus Nikon bodies used a (interchangable) split image rangefinder/microprism system. Such a focusing screen would have made focusing much easier, but could not be used in the QV-1000C due to blackout problems (making the split screen unusable). Needless to say, the camera had its issues. John Harcourt explains: "Every design has flaws, and the flaw in this case was optics designed for the small format with too-small apertures. The designers did not have off-the-shelf solutions for that projection circle and long back focus. They chose not to match the back focus and mirror box of the F-mount, and they did not want to use relay lenses (which they did in the E1-E3 which proved to be a very challenging choice). What eventually became an advantage in DX lens design (look at the 18-200 DX for example) was problematic because they did not have the design programs in place to quickly produce the short focal length and focus range zooms at higher speed without prohibitive increase in size, cost and weight." This was the traditional mirror-box, long back focus, reverse telephoto design, so a slower lens with a darker image was the Achilles heel, if you will. Remember also that there was nothing to compare it with at the time, and it was assumed that photographers would somehow live with certain constraints to gain the advantage in productivity. In retrospect they chose the wrong constraint, believing that high sensor sensitivity gave them the leeway to work with smaller apertures and thus more realizable lens designs, and they somehow did not emphasize usability. "I should say that although it was built as a short run prototype it had all the ergonomic qualities of a regular production camera, and not a trace of cut and try prototyping. It was, in short, a decade ahead of its time in every way, and it was methodically designed that way. IMHO, a remarkable achievement," summarises John Harcourt. Regarding the two QV lenses, there's little doubt that they will easily outperform the camera's sensor. The 11-120mm always reminds me of Nikon's current 70-200mm f/2.8 lens. Obviously, these are two very different lenses, but in many ways they feel the same - we're talking high quality, pro glass. In any case, it could almost seem as if the two QV lenses were designed for a better camera, but according to Mr. Toyoda, "no plan for successors to QV-1000C existed." A rare QM-100 F mount adapter. Photo by Uli Koch. Unfortunately, there's no way to mount the QV lenses on a F mount camera (there are probably several reasons you wouldn't want to do this, but it would be fun to try), but Nikon made an adapter to do the opposite. 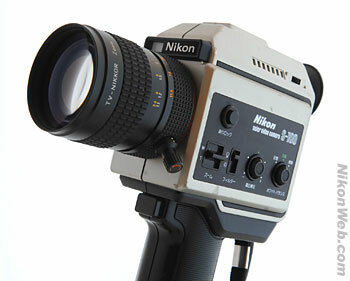 Using the QM-100 you can mount a regular Nikon F lens on the QV-1000C. The optional adapter was not part of the otherwise complete QV kit, and is probably rarer than the camera itself. To date, I've only come across two such adapters. One of them belongs to Uli Koch, the other is on display at Espace Nikon in Paris. Unlike other adapters, the QM-100 doesn't have any lens elements. 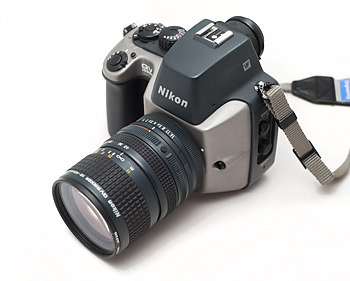 It serves two purposes: making a physical connection between camera body and a regular Nikon F mount lens, and converting the mechanical lens aperture into electrical signals for the QV-1000C. Battery performance is always an issue with a 20+ year old electronic device. I had one of my original Nikon BP-60 batteries recelled, meaning it's now even better than it once was. Battery technology has come a long way over the past two decades. Canon RC-760 - seen here with a 11-66mm f/1.2 lens - was a higher resolution version of Canon's first still video camera, the RC-701. It is not known how many Canon SV cameras were made. I've asked several Canon people, including Canon USA's knowledgeable tech guru Chuck Westfall, but no one seems to know how many Canon still video cameras were actually made or sold. Personally, I've always had a feeling that Canon sold (a lot) more still video cameras than Nikon. A rough indicator: searching for the two professional Canon models (RC-701 and RC-760) on Google will return three times as many hits as a search for Nikon QV-1000C: 48,660 vs 16,500 hits. Pretty impressive numbers, by the way, even if much of it is garbage (February 2011). Also, it's relatively easy to find a Canon RC-701 or RC-760 on eBay. You just have to be a little patient. I've seen at least 18-20 such cameras listed over the past five years, and I haven't been looking very hard. The actual number offered for sale is probably higher. How many QV-1000C cameras have I seen? One. Unfortunately, I saw it too late. It sold for the ridicoulus low price of £22 (approx. $39)! This may very well have been the camera deal of the century! This was in December 2005. According to Uli Koch, another QV-1000C was sold on eBay Germany in 2001. Unless we've missed any, that's two cameras in a decade. Kenji Toyoda: "I don't think Canon RC-701 and 760 sold more than QV-1000C. Japanese press people did not interested in Canon RCs because image quality was not sufficient even for small pictures on newspapers. On the other hand, they actually purchased QV-1000C and actually used it to take pictures for their papers." Alan Bartlett: "I can only really reflect what I knew talking to the newspapers, news agencies, police forces and military across Europe, various Nikon colleagues and competitors (yes, we used to talk to one another, even ocassionally with Canon). Outside of Japan, I feel Canon probably did sell more SVCs than Nikon. They certainly had more demonstration units available for loan and promotional activities than we did. However, the feedback I got from the people I spoke to across Europe suggested that the Canon unit, just like the Kodak and Nikon units did not offer the resolution that was needed for anything other than a single column image so was of limited interest. 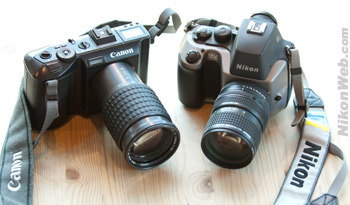 Canon RC-760 alongside Nikon's QV-1000C. I can understand Toyoda-san's comments. 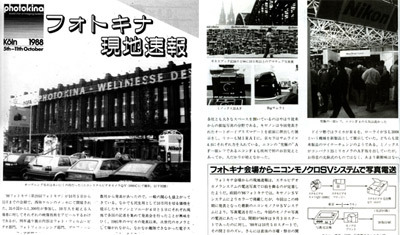 My impression at the time was that Japanese newspapers tended to reproduce images at a fairly small size but European newspapers, particularly tabloids, wanted bigger pictures across several columns and even the whole page. Also, in the late 80s, Japanese newspapers and news agencies, with whom Nikon had an extremely strong relationship, wanted to be seen to innovate above all else. I think these market differences explain the greater acceptance of the SVC in the Japanese domestic market. Canon did sell some units to the UK Ministry of Defence but these were only a relatively small number for evaluation. I think only 4 or 5 Canon units were ever sold to newspapers in the UK, all heavily discounted. My impression was that Canon had a bigger production run than Nikon and may have produced around 200/250 units worldwide but ultimately couldn't sell many of these even at discounted prices. I haven't seen too many Canon RCs available on eBay, at sales, etc, all of which suggests their production run was very limited too. Canon was a more consumer focused brand, so their marketing team did not have any technical or market specialists and their relationship with players in the news publishing sector was limited. They did however have a big PR team that issued a lot of press releases saying that their was a huge interest in their RCs which gave the impression in the marketplace that they were very successful. As I said, I believe they heavily discounted their RCs just to make some sales. On balance, I feel that the most successful electronic product in the news sector was the Kodak system." John Harcourt on Nikon vs Canon still video cameras: "The QV-1000 was much more about state-of-the-art, in the traditional sense. It was designed purely as a tool for reportage (newspaper) photographers, and so the design goals were very consistent with what they needed to do their job. Color was merely nice-to-have, compared to getting a sharp, well-defined, high dynamic range negative, quickly into the hands of expectant editors. It was designed to fix a single problem very well. Get a breaking news photo on press in as little time as possible without compromising quality standards. It had to behave well in the hands of a skilled photographer who had no time to learn about idiosyncrasies of new and unfamiliar electronic devices. It had to deliver image quality and performance as close as possible to 35mm Tri-X in a Nikon F3. The reason I said the Canon and Sony were flawed is precisely because they paid less attention to traditional ergonomic issues, and this made the still video cameras clunky and inconvenient for a working photographer. Sony had little or no camera design experience on staff (just camcorders, with a radically different set of challenges), so the design team was handicapped. Canon gave the project to designers without camera design experience, presumably because this was looked at as a totally new way to make pictures instead of an incremental variation on an old way. It was early days, and therefore the right time for daring innovation and outside-the-box thinking, so they probably never intended to produce an ergonomic or familiar camera for professionals. Nikon�s objectives were different because they were really just looking at their own understanding of immediate professional applications with incremental changes. As you say, many agencies and photographers used the Canon or Sony, even though they had these issues, because they had other advantages (such as color) that Nikon assumed newspaper photographers did not need. The original Kodak DCS connected to the Digital Storage Unit (DCS). Kodak announced their first digital camera, the Nikon F3 based Kodak DCS in 1991. The cheapest model cost $20,000. A total of 987 units were sold from 1991 to 1994. Rare deal: a QV-1000C camera body sold on eBay in January 2006 (serial no. 200292). 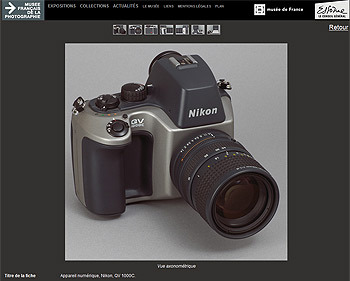 Nikon QV-1000C at the website of Musée français de la Photographie (serial no. 200121). 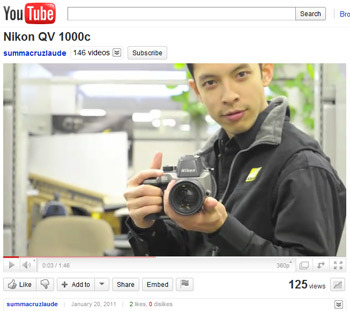 QV-1000C video posted on Youtube in January 2011. QV-1000C on the BBC television program Antiques Roadshow in 2007 (serial no. 200222). As previously mentioned, I tracked down the only QV-1000C kit in Norway with the help of Interfoto, the Norwegian Nikon distributor at the time. The camera's serial number is 200242. After having been evaluated by several major newspapers (it was probably used by the newspaper Aftenposten at the 1988 summer Olympics in Seoul), the kit was finally loaned to a small local newspaper in need of a filmless camera for quick and easy transmission of images. Unfortunately, the camera was only black and white, at a time when most newspapers transitioned from black and white to color photography. Also, image quality simply wasn't good enough, so the newspaper Østlendingen ended up buying a Hasselblad Dixel film transmitter instead. Realizing it was too late to sell the camera, Interfoto simply gave it away. It then spent the next decade in a flight case stored in a basement, before I got in in June 2005. This is a complete kit, including the QV-1000C body, two QV lenses, a QV-1010T transmitter unit, batteries, charger, some Nikon and Canon branded Video Floppy disks, the original instruction manual, a QE-110 Floppy Disk Eraser and the weird looking QA-10 acoustic coupler. A year later, I got my second QV-1000C from former AP photographer Bob Daugherty. In addition to these two cameras, I know about ten other QV-1000C units. We can only speculate how many of the original 180 kits have survived. It's very likely that many of them were simply thrown away as newspapers upgraded to digital cameras during the 1990s. Uli Koch has one complete kit (camera body serial no. 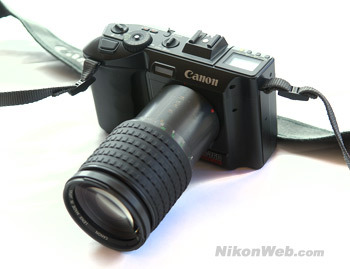 200322), which he bought in 1996, without the standard QV Nikkor 10-40 zoom lens. In 2001, Uli bought a second QV-1000C camera with the 10-40mm lens on German eBay. He then kept the lens and sold the camera body to another German collector (serial no. 200299). A fifth QV-1000C was owned by Peter Lownds, a well known Nikon collector who passed away in January 2017. The camera was briefly shown in an episode of the BBC television program "Antiques Roadshow" in 2007. The camera's serial no. is 200222. UPDATE January 2019: The whereabouts of this particular camera is currently unknown. Nikon UK have one camera, serial no. 200011. That's eight. Another QV-1000C was shown at a Nikon Kenkyukai Tokyo meeting in July 2005. The camera is owned by a Japanese collector. Serial number unknown. 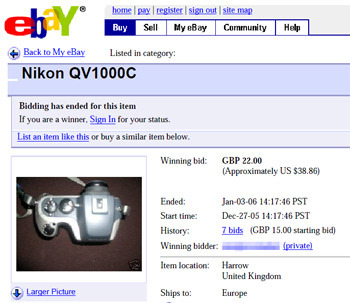 In January 2006, a German NikonWeb forum member bought a QV-1000C camera body (without lenses) on eBay from a seller in the UK. Serial number 200292. In March 2013, another QV-1000C turned up at the Dutch photo dealer Foto Henny Hoogeveen in Noordwijk aan Zee, approx. 40 km from Amsterdam. The kit was bought from a former Nikon manager in the Netherlands. It's not for sale and will be displayed as part of a Nikon collection in the store. The camera body serial number is 200106. Both lenses have serial number 200105 (a first - all other serial numbers recorded so far are unique). UPDATE: In October 2018, it turns out the kit has been sold. UPDATE: In December 2013, a QV-1000C with two lenses (complete kit without the transmitter) was sold on the Swedish auction site Tradera.com. In November 2014, the camera was sold once again via WestLicht Photographica Auction in Vienna. The camera's serial number is 200230 (10-40mm serial no. 200091 and 11-120mm serial no. 200083). So the total count of known QV-1000C cameras today is 14 or 15. I'm sure there are a few more out there, but needless to say, this is one of the rarest cameras you'll ever find. Consider yourself very lucky if you have one! Looking at the data collected so far, it seems like all QV serial numbers are unique, meaning that you won't find a lens, camera, transmitter or battery charger with identical serial numbers. 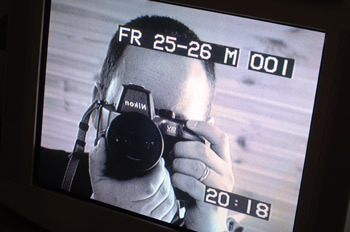 This means that some 900 unique 200xxx serial numbers were used (180 kits containing camera, two lenses, transmitter and charger). Also, it seems like the same 200xxx range of serial numbers were also used for the QM-100 F mount adapter. In March 2013, I came across two lenses (10-40mm and 11-120mm) with identical serial numbers: 200105. This is the kit owned by the Dutch camera store mentioned above. In addition to Kenji Toyoda, Alan Bartlett, John Harcourt, Bob Daugherty and Uli Koch, special thanks goes to former AP photography director Hal Buell and AP photographer Ron Edmonds for providing valuable feedback and assistance. 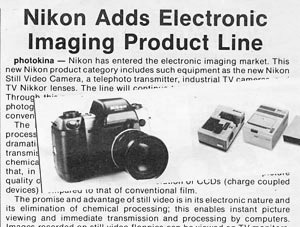 I'd also like to thank Chuck Westfall of Canon USA for background information on Canon's early electronic cameras, and Tor Weatherstone for providing original Nikon press material from Photokina 1988. Introduction of Nikon SVC, letter from Nikon Europe to Swedish distributor, dated Aug 23, 1988. Technology; Innovations in Photography, Barnaby J. Feder, New York Times, October 29, 1981. George Garneau, Editor & Publisher magazine, January 28, 1989. "Variety of inaugural images offered", News Photographer magazine, June 1989.